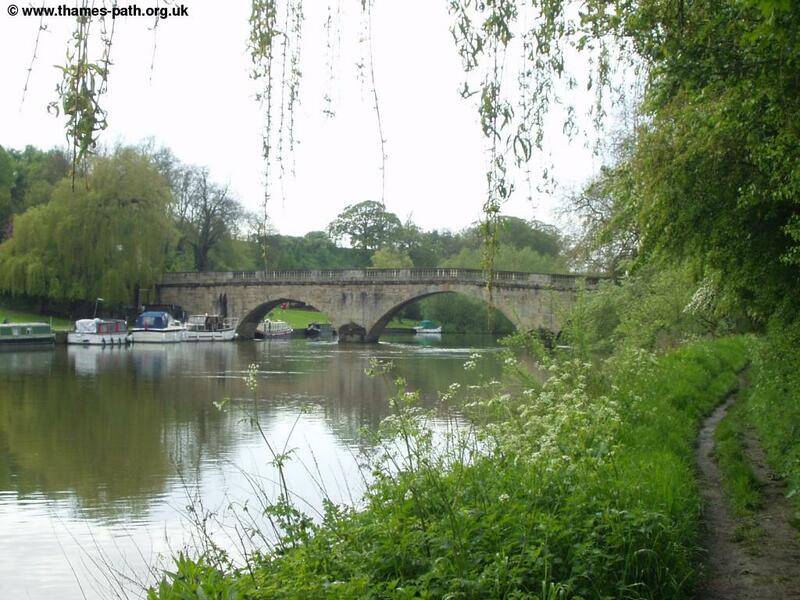 This walk goes through rural Oxfordshire and starts in the small town of Cholsey passing open meadows into the attractive market town of Wallingford. From Wallingford it's a short walk past meadows to Benson Weir, where the Thames path crosses the river. 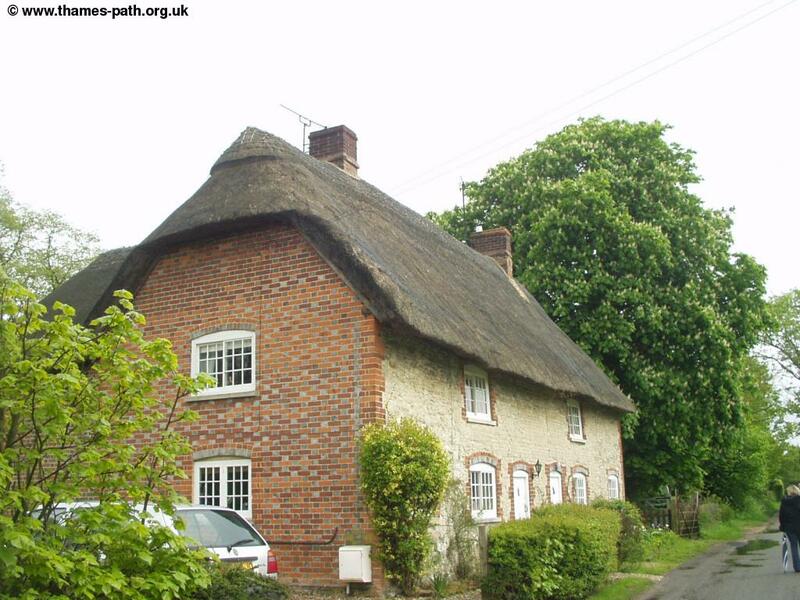 The Thames Path once again briefly leaves the river to pass through the lovely village of Shillingford, returning to the Thames just out of the village, and continuing to the edge of Dorchester. 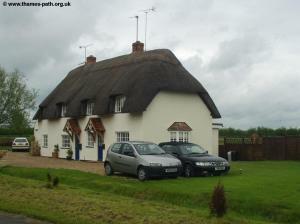 Cholsey is easily reached by road, as it's just off the A329. 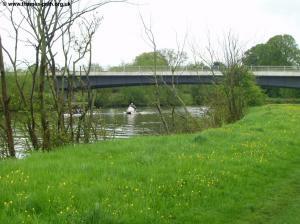 From the M4, exit at junction 12 and join the A4 into Theale. At Theale join the A340, which joins the A329 at Pangbourne. Continue on the A329 into Cholsey. 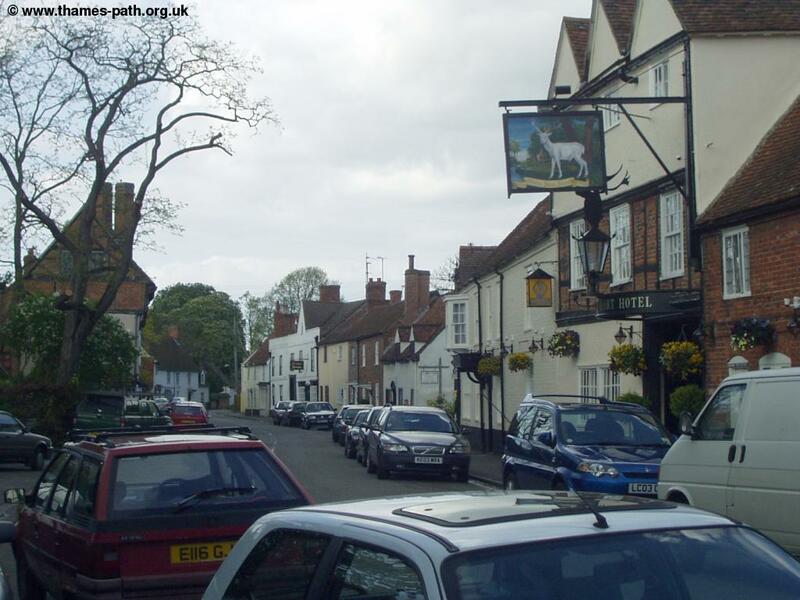 From the A34, join the A4130 towards Didcot and on arrival in Wallingford join the A329 south. 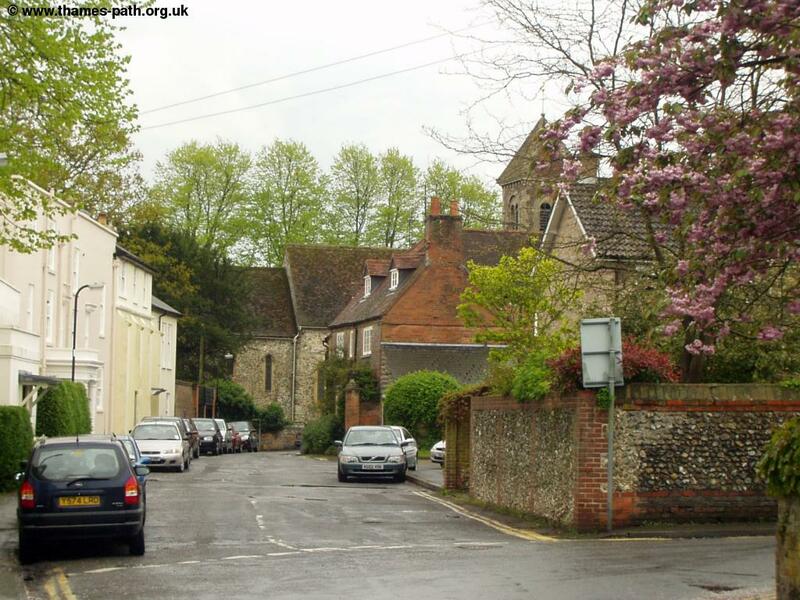 There is a car park at the station, otherwise on-street parking is easy to find. Public Transport to Cholsey is good, with a train running every 30 minutes to Cholsey from London Paddington, Reading, Didcot and Oxford. Trains generally run every 30 minutes Monday - Saturday and hourly on Sundays and are operated by First Great Western Link. From Cholsey head up Papist Way up the hill towards the A329. 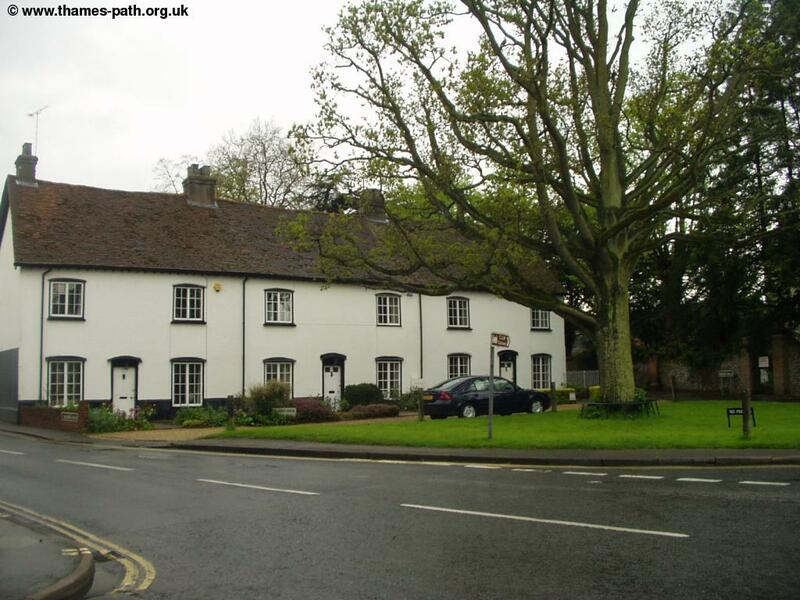 When you get to this busy road cross and continue, passing the former Fairmile Hospital, which is now being developed into houses. The road soon narrows and becomes a dirt track as you get to the Thames. When you are back to the river, turn left. The Thames is rural on the way towards Wallingford. 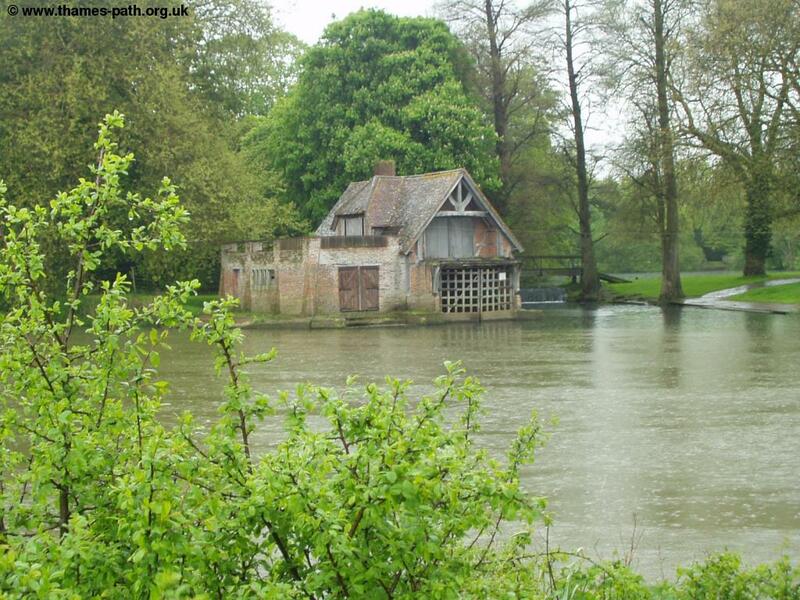 You pass over a stream to the left and then past an old-looking boat house with a small weir next to it on the other side of the river. 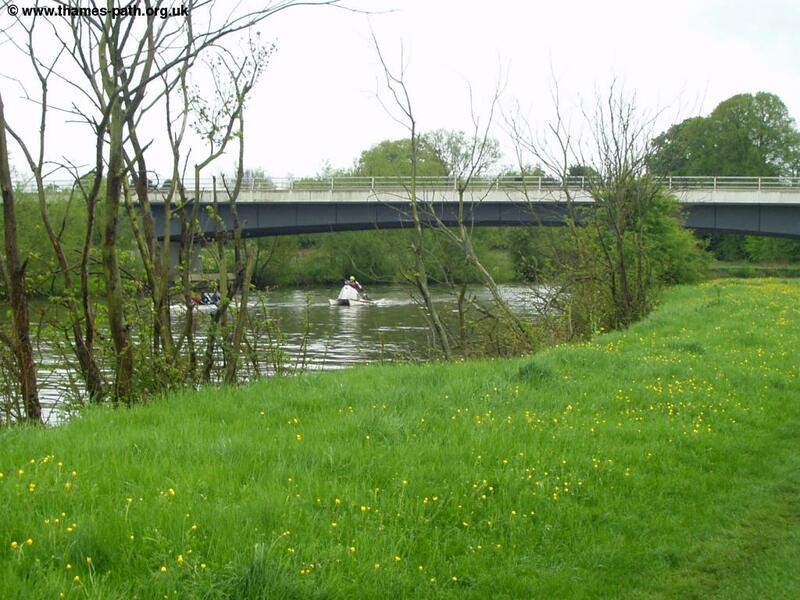 Soon the rather ugly road bridge is ahead - the first sign that the path is approaching Wallingford. Once under the bridge the town still seems quite a distance away, but it doesn't take long to get into the town, where the Thames Path briefly leaves the edge of the river by a row of cottages. 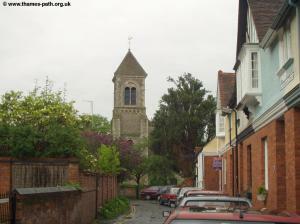 You should pass through a path by the church here, although I continue in to St Mary's Street. Once past the attractive church, with it's tall spire, you come into the aptly-named Thames Street, which runs parallel to the Thames (although the river is out of view along most of this street). Soon you emerge onto the High Street. If you turn left here you will come out into the towns attractive market square. 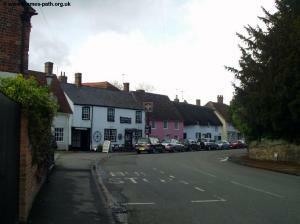 The town is extremely historic and a delight to walk around. 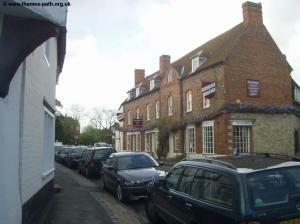 It has the remains of a castle (mostly demolished on the orders of Cromwell), the beautiful town hall that was built in 1670 and even a steam railway to Cholsey. 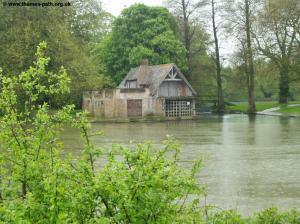 Wallingford was once bigger than Oxford and was a similar size to Winchester. Once across the High Street the Thames Path rejoins the river by the lovely bridge at Wallingford. 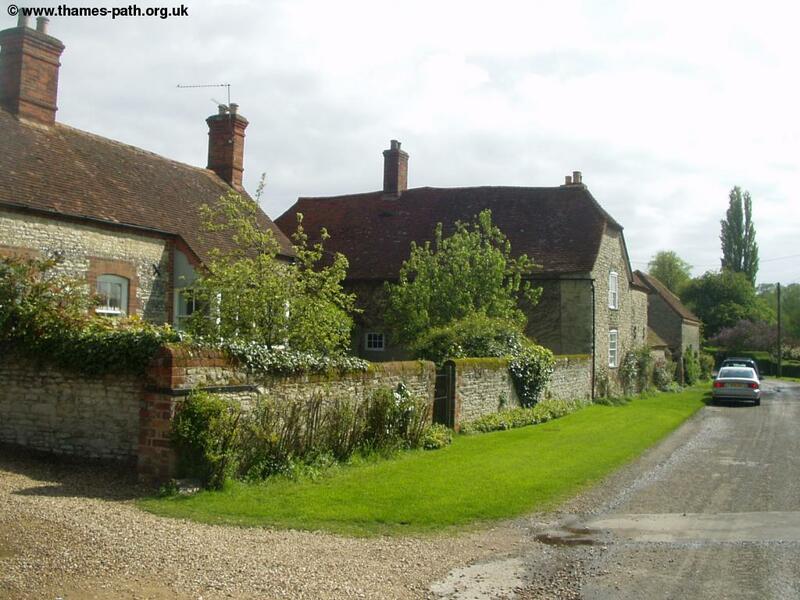 The Thames path quickly returns to a more rural setting. The castle gardens, where the remains of the castle are can be seen to the left. As you head away from the town look back for good views of the town. Soon you come to Benson Lock. 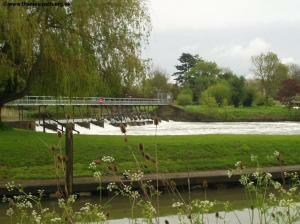 The Thames Path crosses the lock here (at least in theory!). At Wallingford there was a sign saying the Thames Path was closed over Benson Lock, so on getting to the lock I had to retrace my steps back to Wallingford town centre. 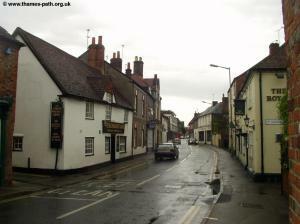 Once in the town centre, I crossed the bridge into Crowmarsh Gifford, and turn left into Benson Lane. past a research centre, and joining the busy A4074. where I then turned left into Preston Crowmarsh to re-join the path on the other side of the lock. 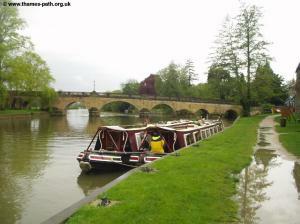 The path across this lock should be re-opened again now. Once across the Lock, the path continues on the small lane from Preston Crowmarsh towards the busy main road. The town of Benson, with it's church is just the other side of the road. 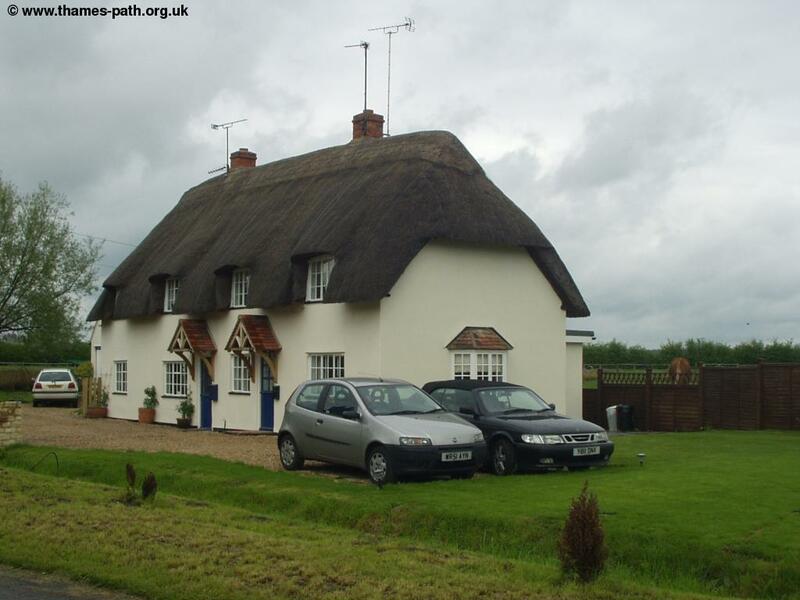 Just as you come to the main road, turn off to the left, where there is a small paddling pool and continue passing a mariner and small Caravan Site. Very soon you will see the elegant bridge in Shillingford ahead, with a collection of boats moored by the Hotel across the river. 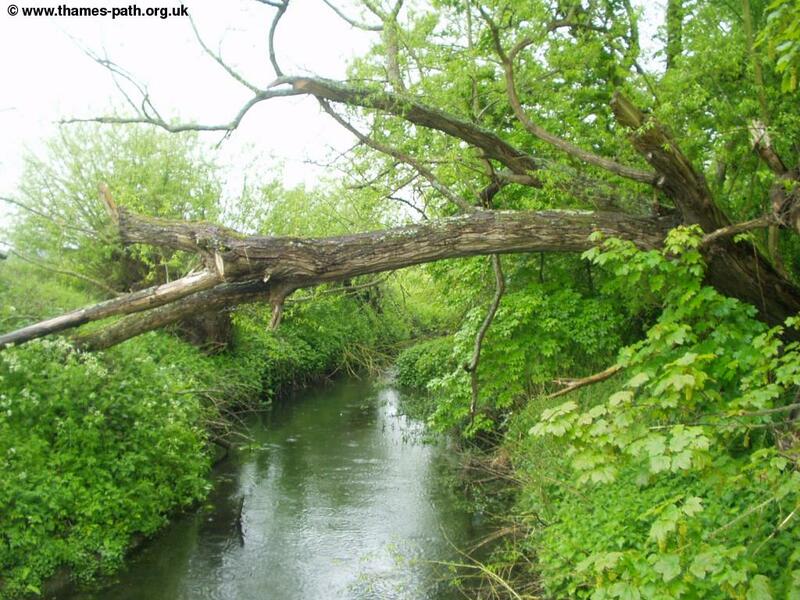 As you get towards the bridge the path goes off to the right, climbing towards the bridge. Once across the road, take the first lane to the left. 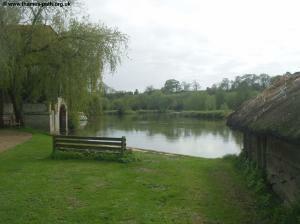 You emerge at the river at Shillingford Court where there is a pretty thatched barn and a handy seat. 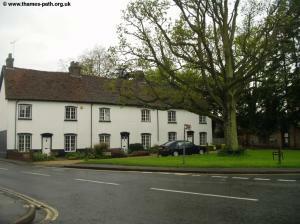 Here the Thames Path briefly leaves the river once more, so walk up Wharf Road towards the main road. When you get to the end of Wharf Road and onto the main road by the pub, you need to turn left, but you have to cross the road as there is no footpath on this side of the road. 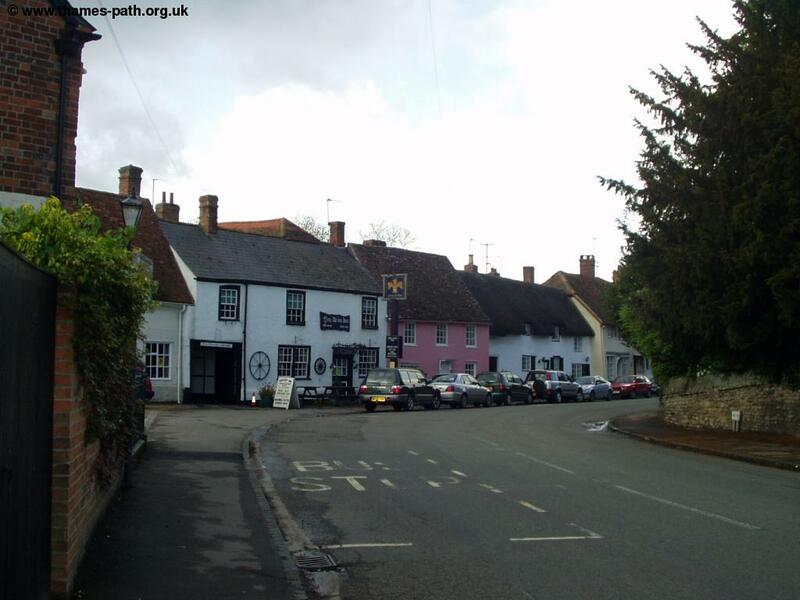 Once across the road, continue next to the busy road for a couple of minutes, but look out for a sign for the Thames Path to the left on the other side of the road, where you return to the river side. 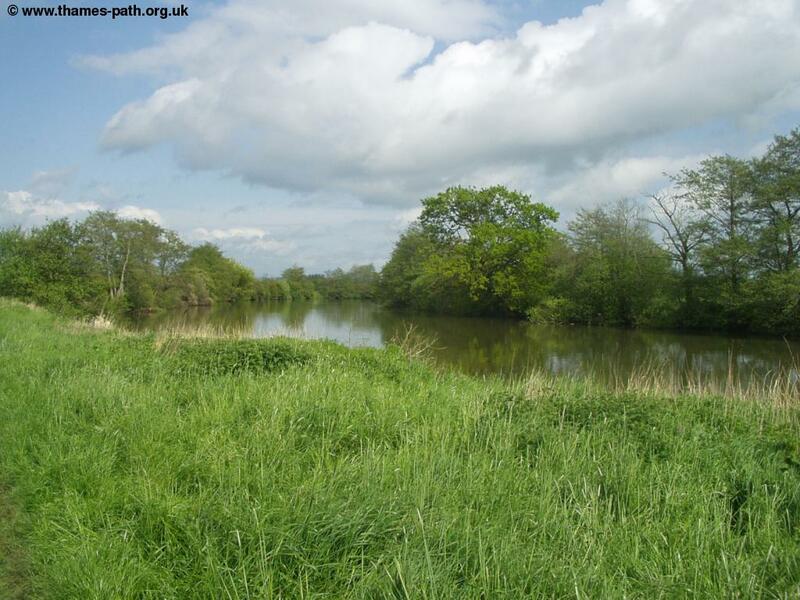 Although there is some noise from the road for a while, this part of the Thames Path is otherwise peaceful and undeveloped. 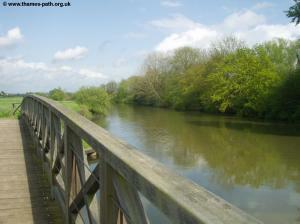 Soon you get to a wooden bridge over the River Thame (not to be confused with the Thames!). As the Thames Path crosses to the other side of the river a little distance ahead I turned right onto the footpath here just after the footbridge into Dorchester. You pass the Dyke Hills on the left on this path, part of the defences of the town and emerge on a residential street (Whitenham Lane) to the south of the town. Continue more or less straight ahead into this beautiful Roman town. 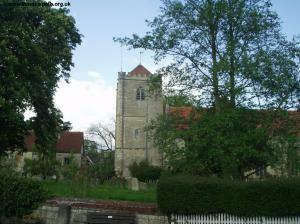 Dorchester is best known for it's beautiful Abbey, which dates from 1140. 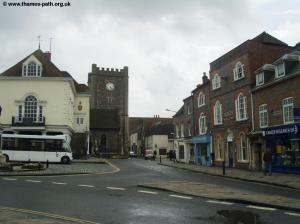 A museum is also housed in the buildings of the Abbey and the High Street is also an attractive street. 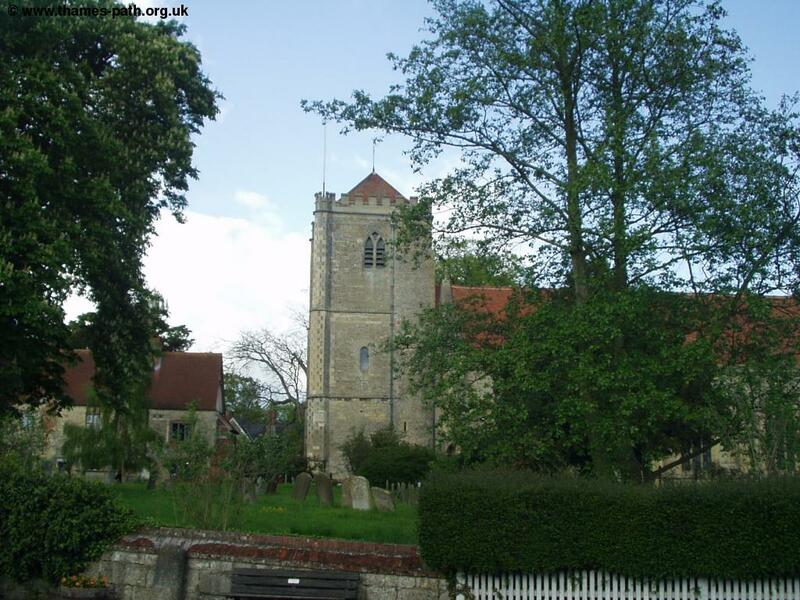 There isn't a station in Dorchester, so you'll need to travel by bus back to Cholsey. Thames Travel bus 105 runs at peak times only, Monday - Saturday from Dorchester to Shillingford, Benson, Wallingford and Cholsey, running close to the station at Cholsey. This bus also goes to Berinsfield, Sandford, Littlemore and Oxford in the other direction. Although this bus only goes to Dorchester at peak times, the drivers might stop in the layby on the A4074 (they did for me), a short walk on a footpath into Dorchester. Thames Travel service 139 also runs hourly Monday - Saturday from Dorchester going to Shillingford and Wallingford to the south, and Berinsfield, Clifton Hampden, Culham and Abingdon to the north and west. 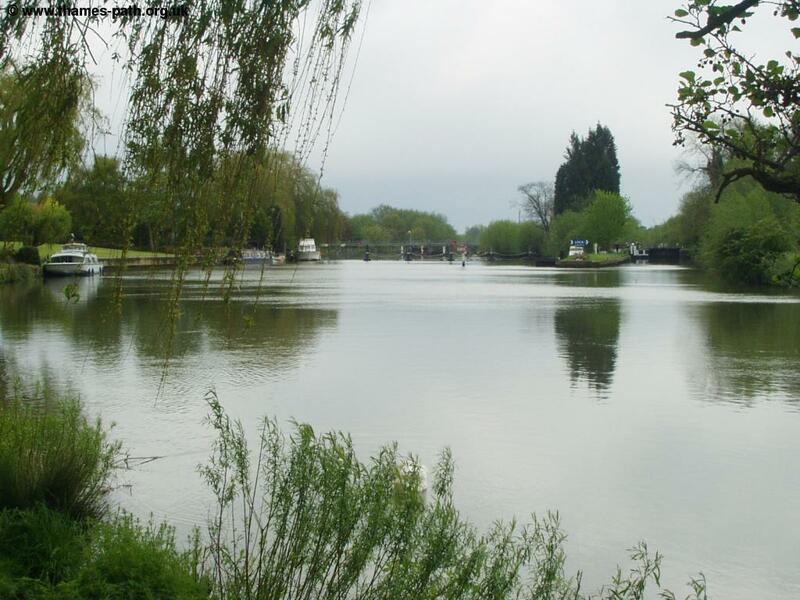 On Sundays Thames Travel service 137 runs once every 2 hours from Dorchester to Clifton Hampden, Culham and Abingdon and to Shillingford, Benson, RAF Benson and Wallingford, and also normally continues to Goring and Streatley railway station. Long distance rail services are available at Oxford to the Midlands and North and south to Dicot, Reading and London. Local services operate from Goring and Streatley and Cholsey stations to Didcot, Oxford, Reading and London Paddington. Alternatively on Sundays if the above service is too infrequent, consider using Thames Travel service X39. This service calls at a lay-by off the A4074 at Berinsfield. To get to Berinsfield head north up Dorchester High Street, continuing into Oxford Road at the end of the High Street. At the end of this road it becomes a path, emerging onto the A4074 (there is a pavement). At the busy roundabout, go straight on the A4074 towards Oxford, where you'll have to walk on the grass at the side of the road. Very soon after this roundabout, there are two white shelters on either side of the road where this bus stops. It runs hourly from here to Nuneheam Courtenay and Oxford to the north and Shillingford and Dorchester to the south. 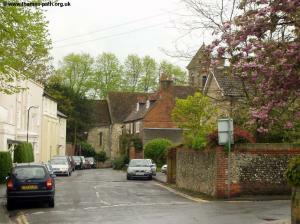 As with the 105 bus above, the driver might be willing to stop in the laybay on the A4074 on the edge of Dorchester.